One thing you can count on in an Epic Mini Life is learning how to navigate the best tools for the task. Today we’ll focus on getting from your current place to the next. Traditional travel is simple. You’re leaving the home airport, going to the destination (potentially with a layover), renting a car, and spending your evenings in a hotel. Yes, it can be complex, but just wait. While planning our travel, the destination is simply one of many stops along the way. For example, our first trip will be from Holland, MI., to Dallas. Normally you book a flight, have someone pick you up from the airport, and it’s a done deal. With the 5th wheel, we need to set some variables, and use those as a guide. Heather and I have decided that we’re going to start the journey by driving no more than four hours per day, and we’d like to front load it in the morning. This will leave plenty of time for work, exploring, and relaxing. When is the last time your used your favorite app to plan a trip from A to B with stops every four hours along the way? I hadn’t seen that feature in any navigation app, until the first on the list. The first “app” is actually a website called Furkot. Trip planners aren’t hard to find, Google itself does a great job, Apple Maps, Waze, and others nail it for traditional driving. What makes Furkot special is that you can set lots of extra parameters. If you look carefully, I set a maximum of 480 miles per day, with 5 hours on the road (1 hour for a stop). With that data, the site will plot what it thinks is the best location for a night’s rest. Furkot will allow for hotel stays, flights. While Furkot will also suggest camp sites, what we need the most from Furkot is the estimated location for each night’s stay. To do the rest, we’ll use a couple of the other purpose specific apps. This one is a bonus. The Technomadia App Collection is actually three apps in one bundle! Coverage helps you determine what the coverage area of each of the four major networks looks like across the US. It’s updated regularly, and pretty much says that if you have a combination of AT&T and Verizon, you’re good to go. State Lines answers many of the common questions you have when crossing from one state to the other. For example, and specifically for this use case, how long are you allowed to stay at rest areas? There are dozens of other data points, like minimum speed limits, state park entry fees, in-grocery beer/wine sales status/hours, sales taxes and more. It’s being redeveloped from the ground up, so be ready for a great update soon! Public Lands provides details and maps of our country’s… well, public lands. It’s a great tool to find National Forests, Bureau of Land Management, or Army Corps of Engineers controlled lands. If you drive, the cost of fuel is always in the back of your mind. Whether you’re flush with cash, or looking to save, it’s a necessity. So why not incorporate a little technology? GasBuddy tells you how much fuel costs near you, or near any location. I’m not going to tell you that you should always drive to the cheapest fuel, but this little gem will tell you that the next stop down the road is 10¢ more per gallon, and you should fuel up now instead. When you’re dealing with 100 gallons, 10¢ makes a difference. Like, buying a whole lunch difference, or a night at a state camp ground. When planning a trip, knowing what’s ahead on the road can be a challenge. 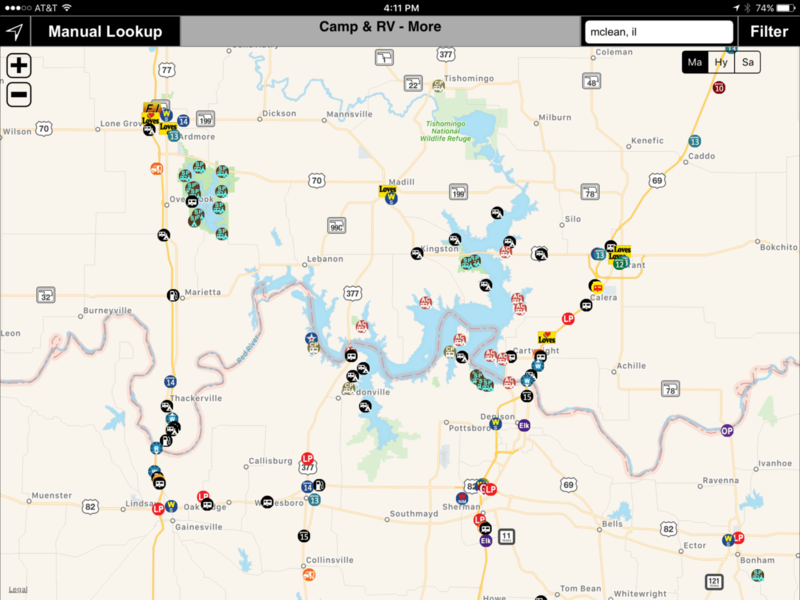 You can search for things – like restaurants, fuel, or overnight camps near a place on the map, but they’re usually disconnected from your route. Roadtrippers solves this by showing you matches within a specified distance from your route. The whole route! So on our trip from Holland to Dallas, we can easily see camp sites that are within 30 miles from the main route. The website is (in my opinion) much more useful as the app is written for iPhone (not iPad). Hopefully that will be fixed soon. It also provides fuel cost estimates, which is certainly helpful. Trips can be shared, and they provide tons of great “experience” trips too, if you’ve got the time. It’s a great piece of technology and will fit well into the toolbox of planning apps. We’d love to hear from you. Feel free to comment here, on Facebook, or anywhere you find Epic Mini Life.